Peter Schiff is a famous gold proponent and investor, and more recently he has become known for his hatred of bitcoin. That is why it may seem odd that Schiff's Euro Pacific Precious Metals has announced that it is pairing with bitcoin payment processor BitPay in order to allow investors to buy gold and silver through Euro Pacific by using the digital currency. In a November 2013 appearance on CNBC's "Futures Now," Schiff, chairman of Euro Pacific, declared that bitcoin was in a bubble that resembles "modern-day tulip mania." He added that "I don't think it's going to end up being a source of commerce for the world." On Wednesday, BitPay announced that it was partnering with Euro Pacific in an arrangement that will allow customers to spend bitcoin in exchange for precious metals. But Schiff maintains that there has been no change in his thinking. "I haven't changed my views. I still think that there is a bubble in bitcoin, and I don't think that we've seen the lows yet," Schiff said on Thursday's Futures Now. For that very reason, "I certainly want people who own bitcoins to buy precious metals, which I see as a much more secure and reliable source of value." To be sure, the partnership does not mean that Euro Pacific is taking any direct position in bitcoin. BitPay converts the bitcoins from customers into the U.S. dollars in which Euro Pacific will be paid. "By partnering up with BitPay, I'm not actually accepting bitcoins," Schiff said. "It's just that if you do have bitcoins, you can make the exchange using BitPay. You give BitPay your bitcoins, they'll turn around and give me dollars, and then I'll ship you your gold." But it's more than a mere marriage of convenience. For Schiff, bitcoin investors make for natural gold investors. "The people who have bitcoins, they're worried about central banks, they're worried about fiat currency, they're worried about inflation, and so they bought bitcoins to protect themselves. I think it's a very fertile market for precious metals. I think somebody who's already worried about these things is more likely to want to buy gold than someone who doesn't have any bitcoins." That's why it could make a good deal of sense for Euro Pacific to pair with BitPay. "Why wouldn't I want people who have bitcoins to be able to use their bitcoins to buy gold or silver through my precious metals company? I mean, it doesn't cost me anything to pair up with [BitPay] so there's no downside to me. Maybe I get some extra business, and maybe some people preserve their gains," Schiff said. Still, there could be a risk that Schiff's well-known antipathy to bitcoin turns off the digital currency community. When news broke on Wednesday that Euro Pacific would accept bitcoin, the immensely popular forum reddit.com/r/Bitcoin was flooded with comments like "is this the same peter schiff that was bad mouthing bitcoin a few months back" and "LOL! What a hoot." By Thursday, an image of Samuel L. Jackson from Pulp Fiction appeared on the forum, where instead of threatening "Say what again!" 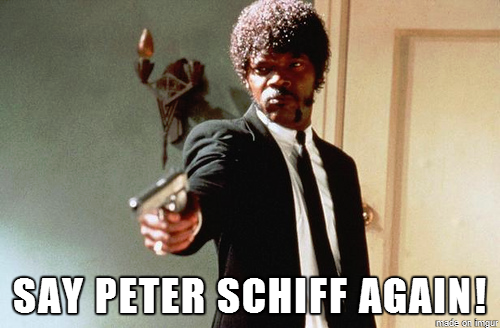 the caption read "Say Peter Schiff again!" Yet Michael Finger, director of marketing at Euro Pacific Precious Metals, is optimistic. "What we hope from the bitcoin community is that they will view this in practical terms," Finger said. "We're the first major gold dealer to accept bitcoin. And Peter's thoughts aside, this is just a very practical opportunity."